Great for home and on the road, these portable and reusable dry erase boards are an interactive tool to reinforce foundational handwriting, phonetics and spelling skills. Because mistakes can be easily wiped away with a tissue, dry erase products let moms and kids see instant progress, and provide a convenient, reusable and great on-the-go sensory experience. Early Learning activity books and games encourage sensory learning through hands-on activities in drawing, color and shapes, math and more, while also building basic motor skills for young learners. With activities that include the whole family, Early Learning games and activity workbooks help build relationships between parents, siblings and budding learners. Practice makes perfect! 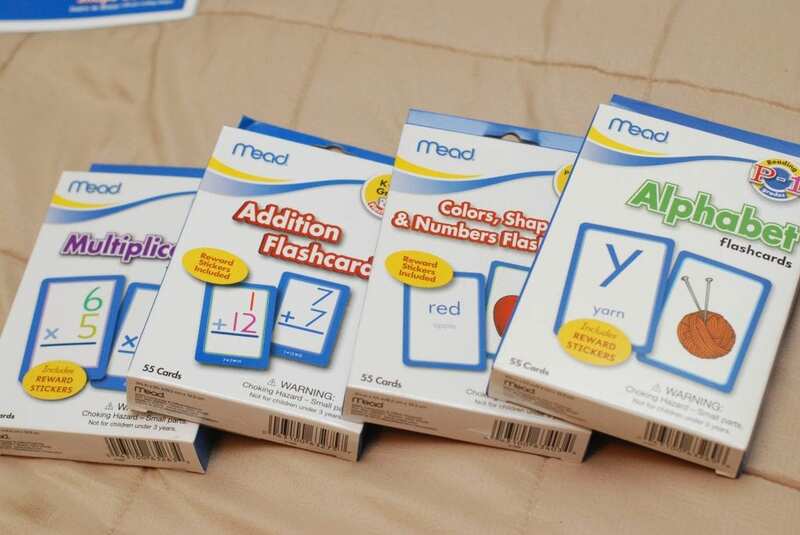 To help kids build memory and better grasp basic concepts through repetition, Mead offers a range of flashcards in its Early Learning line. Perfect for at home or on-the-go, each set includes 55 print-rich cards and reward stickers to build confidence and master the next math or reading concept. Early Learning workbooks supplement school curriculum by helping kids tackle hard-to-grasp concepts at home. Infused with fun activities in writing, phonics, math, reading and more, grade-appropriate workbooks bring everyday experiences to life and encourage thinking and problem-solving at a higher level with practical, hands-on applications and family activities. These products are fantastic for busy parents because they arrive fully assembled and ready to go. My family has been experiencing a lot of sickness over the past few weeks making it difficult to get out of the house. These products have been very instrumental in keeping my three and a half year old busy. I love the dry erase boards because it is so easy for us to use them. Jonah needs practice on drawing straight lines and curves (the building block to writing letters and numbers) so it is easy for him to wipe and start over, he doesn’t need mommy’s help with that. As he gets olds, the flashcards and older workbooks are going to be a lifesaver as we travel or during the summer break when he isn’t at school. I might even use them at school with a few of my students who needs some help in the fine-motor skills area! These make great gifts for young learners everywhere! 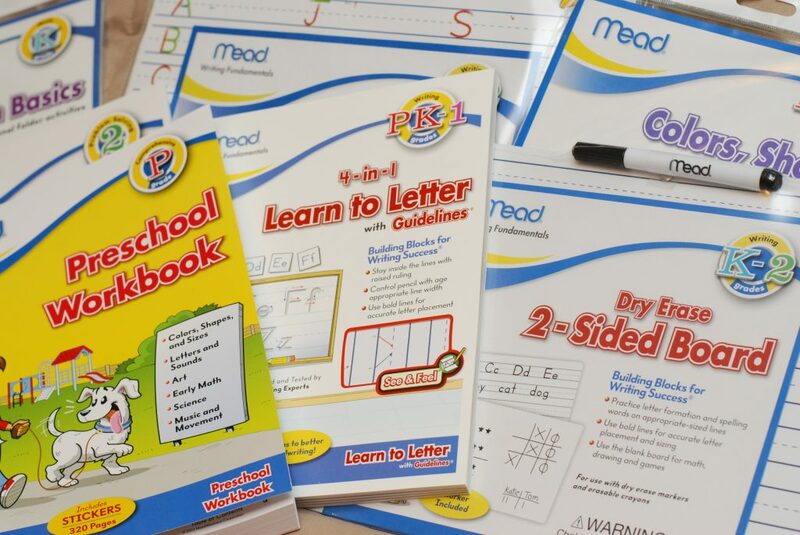 All products are available for purchase on the Mead Early Learning website! To learn more be sure to follow them on Twitter and Facebook. 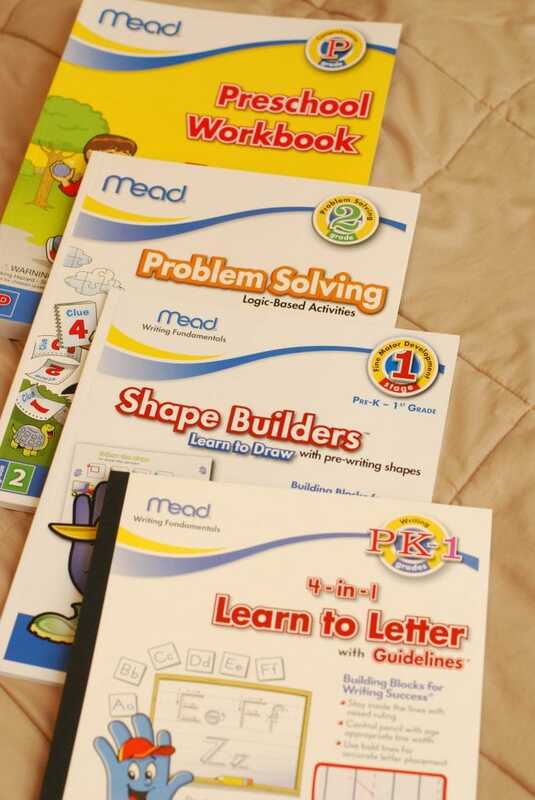 One (1) lucky reader will win a Mead Early Learning Prize Package valued at $75! This giveaway is open to US residents only! This product review was made possible by Mead. I was not compensated for this review other than a product sample. All opinions are 100% mine. We play school at home and learn sight words, colors, shapes, & ABC’s. We like the dry erase board! We can learn over & over! My son loves learning math with food. First we add it and then his favorite part is subtracting because he gets to eat it. By allowing her to join in when cooking in the kitchen. We do educational computer games, workbooks, writing and reading. I love the Primary Journal, K-2. Flash cards, activity books, DVDs, and educational YouTube videos. We play school at home where I try to teach him. Thanks so much for the fantastic giveaway and happy New Year! I like their Dry Erase Capital Letter Book Grades! Thanks so much for the fantastic giveaway and happy New Year! I really liked the Dry Erase Cursive Activity Boards Grades 3-4 cause they look like they would be awesome to teach my child things..
We practice our writing everyday ! 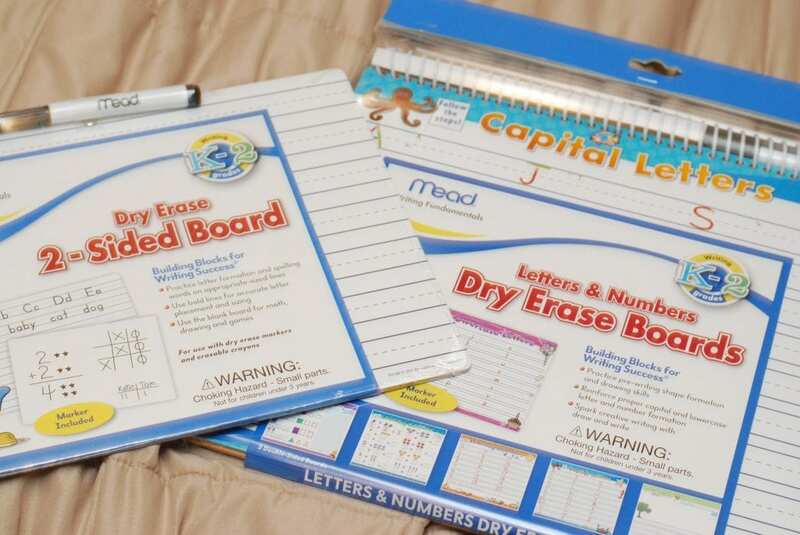 Dry Erase Capital Letter Book – Dry Erase is SOOO great when it comes to numbers and letters ! I’d like to get the Sight Words Flashcards Grades PK-2 for my daughter who’s learning how to read. I like the Dry Erase Capital Letter Book Grades PK-1 because you can practice over and over no paper to replace. We use flashcards and computer games to help her learn. I like the Problem Solving Workbook Pre-K because it has tear out cards to help learn. Not just a book for them to read. I just try to point things out in our everyday life, like counting pieces of food on our plates or pointing to & naming letters on things. I like the success stickers because they’re great for motivation. I have been reading to my daughter since she was in the womb. Thanks for the opportunity. Reading out loud since before birth. Sticky notes with random info – math and vocabulary – stuck everywhere! My daughter loves doing preschool homework and practicing her letters. She asks to do it! Always making it fun. Doing examples with candy. Rewards for hard work. We read a lot and do chalkboard work. Dry erase boards are our favorite. I’m sad to see they discontinued the lined one. We use a lot of hands on approach.We “write” our names in shaving cram,form letters with play doh, and read. We play school and we write on our little chalk board we have! We make flash cards to learn Spanish. I love the dry erase lowercase letters board! I try to incorporate learning into every aspect of our daily lives. My four year old learned about density on a trip to the park after noticing that some things he threw into the pond floated and some sank. He helps me cook, and measure, and we spell out words for each other for fun. We write with bathtub crayons and count everything. I like the workbooks because they’re a great way to focus on specific subjects or skills, and you can mix and match depending on what level your child is at in any given subject. We use workbooks and flash cards. I talk about everything we see and constantly explain things. We spell words and discuss colors and other essential things. Love the Redispace Transitional Notebook Paper Grades 2-5 because it fits right in with our curriculum. I have been using flash cards for years now with all my children. They are easy and convenient to use. I like the double sided dry erase board because it’s a nice and easy size to use. We like to use flash cards. I help her by introducing alphabets, numbers, read a book, and sing together. I like Color Shapes and Numbers Flashcards Grades PK-1 because it’ll be very useful for my daughter grades. I homeschooled our three children and used a lot of flash cards, text books I could buy and used almost everything as a learning experience. My daughter is almost 2 years old and so far she knows all body parts, can say many words, all because we purchased an expensive book set from Southwestern. She watches Little Einsteins and Fresh Beat Band (For her music, and she dances alot!). I make sure I am there with her interacting and further teaching her what everything is. I also read to her at least an hour during the day and then in the afternoon, she has plenty of learning opportunities. 🙂 I also plan on homeschooling her so I’m also educating myself on what she should be learning at her age. I like the Preschool Flash Cards. I always learned very well thanks to flash cards and I think these are designed perfectly for younger children! My son and I watch sesame street together and try to write and practice letters and numbers that he learns from the show. I like the dry erase workbooks especially the alphabet one right now. It’s great to learn without wasting paper and it’s easy to wipe away mistakes then erasing or scribbling mistakes. I listen to classical music with my children then read them a story that goes along with the music Such as Peter and the Wolf. My son is special needs so I use sight words and I try and get him to read everything he can like simple recipies and even the cans like corn etc. I also use websites such as Starfall,com. I also use money and store flyers to teach him to use money. I try to make learning fun for my son, and try to incorporate it into all of the little things, reading, playdoh letters, dry erase boards. He is a busy kid so I try to take advantage of the little moments. We help by doing a lot of reading and letter recognition. I spend alot of time with my grandson and provide him with many hands on activities. I print off worksheets online and work on them with my son. We also read every night for a minimum of 15 minutes. I like the Problem Solving Workbook Grade 1 because it teaches critical thinking skills or teaches children “how” to learn. I talk to them all the time and use lots of adjectives to teach color, size, and shape. I like the snip it. My son is left handed and cutting is difficult for him. We use flash cards and play learning games like Go Fish. I like the connect with color because dot to dots help with hand eye coordination and are fun. Using songs and rhymes help things stick with my kids! Fun worksheets. Age appropriate learning websites for her to play on. The workbooks because they look perfect for learning. We read a ton, use flash cards and practice letters. I want to give him a head start! We do Montessori Activities with our little one. I think the Preschool Workbooks would be great for us because our son is still very young.